Raise your hand if you agree that naptime is wasted on the young. Keep your hand up if you’re totally jealous of the countries that have siestas. Well now you can add Thailand to that list. In an effort to increase worker productivity and afternoon energy, a municipal office in the Pathumwan district of central Bangkok has created a lunchtime “nap room”; complete with wood paneling, pleasantly scented flowers, soft music, and strict rules banning talking and cell phones. As the clock hits noon, the civil servant employees sit around a conference table with their heads down, the blinds are drawn, the lights go out and naptime begins. “I’ve been taking naps at lunchtime for a long time, and decided to introduce the project to my staff in November,” says the district’s top official, Surakiet Limcharoen, adding that this naptime is a way for them to feel refreshed and boost their energy for their evening shift. There are 200 employees, 20 of whom are regular “nappers”, and report that they feel refreshed and energized after their lunchtime nap. I don’t know about you, but I love taking naps. My grandfather took a one-hour nap every day after he ate lunch. Inventor Thomas Edison accredited his abundant energy to taking a nap whenever he felt the need, and Prime Minister Winston Churchill said that his afternoon nap helped him to cope with his responsibilities. Albert Einstein, John D. Rockefeller, Leonardo Da Vinci, Gene Autry, Jim Lehrer, Ronald Regan, Eleanor Rossevelt, and Lyndon B. Johnson, were all believers in napping. And that’s just to name a few. On last Thursday’s episode of The View, David Hoffman, a lifestyle expert, introduced the audience to a wonderful, wonderful invention from Metronaps. 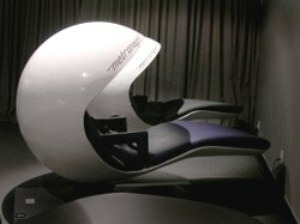 It’s a really cool chair that looks like something from The Jetsons. The chair itself is adjustable for optimum comfort and if you set the timer the seat vibrates gently to wake you up. Plus there is a cover thing to keep out light. Check it out! previous post: Did You Hear The One About The Swine Gang? next post: What ARE They Wearing? Maternity Edition.